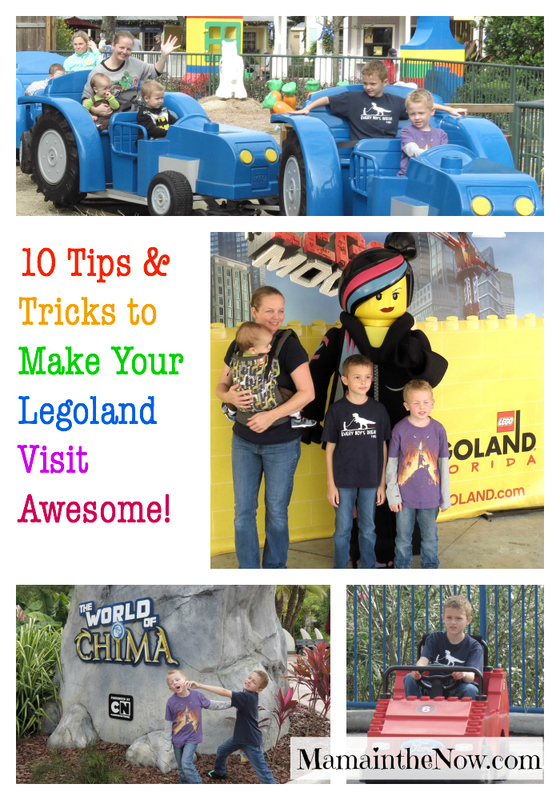 Ten Tips and Tricks to Make Your LEGOLAND Visit Awesome! 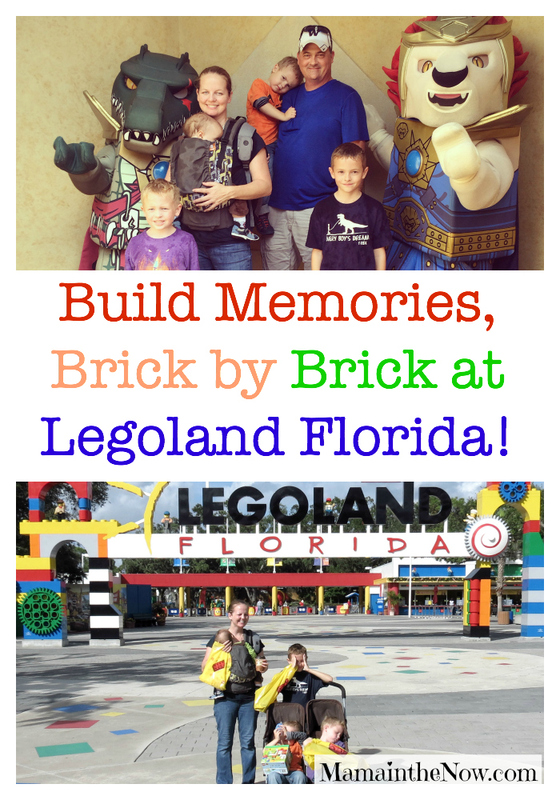 Mama in the Now recently teamed up with Legoland Florida as our Lego-loving family spent the day at the park. 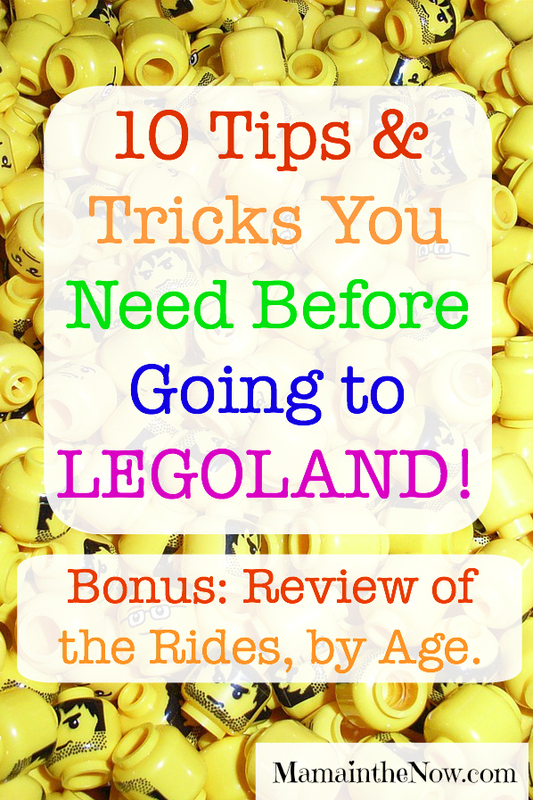 After our highly successful trip Legoland Florida – our best trip to date, I wrote a review and compiled a list of tricks and tips to ensure everyone enjoys their Lego-filled day. The only melting going on will be your ice cream in the hot Florida sun, there won’t be any time for meltdowns of the toddler-kind. We normally go to Legoland at least three times a year. From where we live in South Florida it is a two hour drive north, so definitely conducive to a one-day trip. Legoland Florida is located in Winter Haven, which is about 45 minutes outside of Orlando. For those of you who are not familiar with Florida’s weather it is safe to say that we have one season all year. It gets HOT here, sometimes cool – but very rarely does it get “cold” at least not in the eyes of a non-Floridian. 1. Arrive early. We prefer to be there right as the park opens. The park’s hours are listed on their website, as they change from day to day, or week to week. 2. Buy your tickets online and print them from home. You will avoid having to wait in line at the park. Their website normally lists deals, or you can search for current coupon codes online before purchasing. 3. Go before or after a major holiday. We went the weekend before Thanksgiving and the park was not crowded at all. Try to avoid going on weekends during school breaks or national holidays – unless you love big crowds of sweaty people. 4. Use the restroom before entering the park! (This is a total mom-observation on my part. Only moms would plan bathroom breaks!) There are restrooms right outside the main entrance to Legoland Florida. It is a family tradition that we all use those restrooms before entering the park. There is generally a line to go through the turnstiles, so while one adult holds our place in line, the other will do a bathroom run with the big potty trained kids. This give you more time to play once you are inside the park and it makes waiting in line go by quickly – a true parental win-win. 5. Bring a stroller, at least a small umbrella stroller. Our kids are 8, 6, 3 and 10 months. I wear the baby and then we have the 3 and 6 year old sit in the stroller when they tire out – which they will do EVENTUALLY. Besides, the stroller is also a great way to carry a few essential items (which I will get to soon) – and the big yellow bags full of new Lego sets, which you are sure to leave the park with – trust me! 6. Take a lunch break around 11:30am! (Here goes the mom in me again; I am even telling you when to eat! Force of habit, sorry!) Plan to eat right before the rest of the park guests decide that they are hungry too! 8. Save all your photo cards from your photo sessions throughout the day. Remember to visit the photo shop in guest services before you leave the park. The photographers typically stand right outside and inside the main entrance and they follow the characters around ready to capture your Kodak moments. 9. Bring water, light snacks, sunscreen, hats and sunglasses for everyone in your party – even during the winter, remember: it is Florida! 10. Head straight for the big popular rides as soon as you arrive. Then back-track through the park afterwards. Enjoy the Chima ride, the driving school and the roller coasters as early in the day as possible before the lines get too long. Our kids ventured out of their usual comfort zone on this trip and they tried new rides. It was wonderful to watch each one of them broaden their horizon and grow a little. Jonah (10 months) and Jansen (3 years) really loved the Duplo Village. They both rode the Tractor and the Train with confidence. Jansen was such a big boy as he played with his older brothers in the recently updated Duplo Village Tot Spot and the Splash & Play. Jordan was a day away from turning 6 years old, so he went to both the driving schools: Lego City Ford Jr. Driving School and Lego City Ford Driving School. Personally, I think he enjoyed the Jr. Driving School a little better. Jacob (8) and Jordan are always two peas in a pod, so after they finished the Driving School they went to the Quest for Chima ride with Dada. It is a very wet ride, but oh so fun – even for the people who stay on “dry” land to watch. We all relaxed as the kids raced Speedorz in the Arena, which is slightly shaded and has seating all around. Jacob was such a big boy, he went on the Technic Techicycle all on his own, while we stood on the ground watching him – THAT was a big moment for all of us. After lunch at I-Zone Panini we went to the Build and Test Center at the Imagination Zone. This was an indoor play area where the big kids built Lego cars, while Jansen built towers out of Duplo. There was something for all ages, seating for the adults, cool AC. It was a perfect place to recharge after lunch. We left the park after walking through Mini-land, enjoying the sights of all the Lego landmarks recreated in Lego. The Big Shop was our last stop – it’s now a tradition to do some brick-shopping on our way home! We were back in our car and on the way home by 3:00pm. The day was a raging success, the kids AND the parents had fun. Brick by brick we made memories, shared laughter and smiles – and I felt a little closer to my childhood in Denmark! How was your child’s first amusement park experience? At what age did you start going? Find more information about LEGOLAND Florida: Website, Facebook, Twitter! Nice tips, Tove! I haven’t been to the Legoland closer to me here in Carlsbad, but I’d love to eventually go. Looks fun! The activities are more hands on than Disney – which is one main reason why we love it so much. So glad I found this post! Our family of 10 will be heading to Legoland Florida in a couple of weeks and I’m really hoping for a great first theme park adventure! Thanks for the tips! I hope you love LEGOLand as much as we do. It is a wonderful park for a first theme park – not too big and not too crowded. Let me know if you have ANY questions! I am happy help! Are you staying at the new LEGOLand hotel? I am so grateful for all the tips! We are taking our 4 grandchildren this weekend. I have printed out my e-tickets. Which line do you stand in if you have tickets already? You can skip the first line if you have e-tickets. There are clearly marked signs. Once inside the park you can go to customer service for a little badge that says “first time” or if you are celebrating someone’s birthday – then everyone will wish you happy birthday – it’s cute. I am so happy that my daughter-in-law pinned this site and tagged me on Pinterest! We will be taking a family vacation (12 of us, 5 of which are children ages 2 – 6 yr) to Legoland in Carlsbad. I am so excited to see the grand babies go crazy! 😉 Thanks for the tips! ENJOY Legoland – you will LOVE it! The kids are perfect ages to take it all in – they have so many rides and fun for those ages! During the summer I would definitely go on a Tuesday. You brought up a good point about the camps there, but you will definitely have more families on the weekends vs a couple of camps. I think Tuesday will be slower. Just be sure to check the park’s opening hours – they vary from week to week some times. ENJOY!!!! Wow! So timely! My husband and i are taking my 6 year old for the first time tomorrow. Just question. We are indeed allowed to bring our own water?? They won’t toss it before they let us enter? Thank you for the great tips!!!! You can CERTAINLY bring your own cooler with food. They WILL inspect it at the enterance, but it’s not an issue at all. Definitely stay hydrated! I wish I read this BEFORE we went! Awesome info! So we’re thinking about going Oct 31st do you think it will be super busy? I heard Disney gets crowded. In my experience, LEGOLAND doesn’t get as crazy packed as Disney – which is one reason why I like it so much better. I can’t find a crowd calendar four Legoland anywhere and I would like to know which months are worse than the others we recently went in October and it was wonderful hardly any crowd whatsoever my girls want to go back so we were thinking maybe the first week of April but with that being spring break how bad is it? LEGOLAND never gets as crowded as the other theme parks. There is always a nice breeze and a bit more shade there. I think it will still be enjoyable that time of year. Have a blast. Hi! Thanks for the great info. We are thinking about taking our 3and then 6 yr old. Would a Monday or Tuesday be better? Also I saw that we could bring a cooler. Can we pack a lunch? Or just drinks? Thanks! Vanessa, make sure you check the schedule on their website. They are closed in the middle of the week during the off-season. I think either Monday or Tuesday would be fine. The park really does not as crowded as other Orlando based parks. You can bring a cooler full of food and drinks – no problems at all. I am about to write a new post with some additional tips… bring minifigures for trading – our kids loved it! ENJOY – your kids have perfect ages! Is LegoLand a 1 or 2 day event? We are coming from Ohio and I thought there would be enough stuff for 2 days. I want to plan and prepare properly. I have a 6 year old and a 3 year old. Thanks! Eric, depending on the crowds, you can probably see the park in a day – if you start right when they open (which I recommend any way). However, if you plan your trip during the summer months, seeing their water park would add another day – and would be a blast as well! We are going in october and the park closes at 5pm and doesnt open until 10am 🙁 im a little worried we wont get to do everything… also have you ever stayed at the hotel? Kimberly, I think you can get everything done in that amount of time. However, the LEGOLAND Hotel is a blast to stay at and they also have their own activities and fun there. Here’s a review I did: http://mamainthenow.com/2016/02/know-about-the-legoland-hotel/ We stayed there one night – and we are going out to California this June – staying there four nights. You will have a blast. Do you think it would be crazy to go over Christmas break? Like the Wednesday/Thursday after Christmas? I have been pleasantly surprised at the crowds in the park over the Holidays. We have never experienced unmanageable crowds. ENJOY!!! 1st day: arrive around 1ish (check in pool at hotel). Wow – this sounds like a PERFECT trip! You have planned perfectly for time at the hotel, at the “dry park” and the water park. We also try not to “over-do” things when we travel and visit the park. You will have a BLAST!!! Enjoy. My guess is that there will be less crowds at LEGOLAND, compared to the other Orlando parks. However, remember that LEGOLAND still is a little bit of a drive from Orlando. We have been there for President’s Day before – the weather is so perfect to do parks that time of year – and the crowds are never “insane” like they can be other places. Have a blast. We will be going during the busy time, second week in June, because my husband will be in orlando for business. Is there a particular day of the week that is slow compared to the others? Hello, We are going to Legoland next week. Is it ok to bring bags into the park, like a backpack? We are going to the waterpark also so I was wondering if I can bring a bag with extra clothes and towels in the park. Or do I have to get a locker for all that? Thanks! You can DEFINITELY bring a backpack AND a small softsided cooler to LEGOLAND and LEGOLAND water park. They DO have lockers for your bags, but they also have cabanas, which are really nice to get if you want to get out of the sun. My advice – hit the water park early… as soon as it opens. ENJOY!!!! We are headed to Legoland in 2 weeks. We plan to spend 2 days there. I am having a hard time trying to figure out the best way to save money on tickets. Can you suggest legitimate websites to find coupon codes to get kids in free? I have found some, but they take me to a website that says it is Legoland, but I am not sure as the ticket purchase page looks different than what it looks like on Legoland’s website. Also, do you if we purchase 1-day adult tickets and get the kid in free with a coupon, can both the adult and free kid tickets be upgraded to 2 day passes for $20 each? Thank you in advance! Hi Terra – I hope you have a BLAST!!!! So – my best “discount ticket” advice is: get the “buy one adult, get a kid free” coupon deal for as many adults in your party. For the rest of the tickets, buy them at Costco (I believe they also sell them at Costco online) – in case you have either more adults or kids in your party. Also, keep an eye on the LEGOLAND website for deals. (Apparently promo code: 169907 will get you the B1G1 ticket deal until December 31, 2017. I just checked their website and regarding the ticket upgrade they said the following: Can I upgrade a complimentary ticket to include a second day and/or LEGOLAND Water Park admission? Yes, standard upgrade charges of $20 for a second day and $20 for LEGOLAND Water Park access per day, may be applied to a complimentary ticket. Good luck – and have a blast!!!! Hello, thank you for your website and information/tips provides for Legoland, FL. Our family is going there in a few weeks after Easter weekend for Spring break and I was wondering in your opinion is it worth it to purchase the bands to skips the lines. The price is kind of steep for a family of 4 but we are only going to be there for 1 day so it would be nice to skip the lines and get in as many rides as possible. Thank you in advance. Thanks for checking out my site. I have honestly never experienced lines that were intolerable at LEGOLAND. I honestly think you can skip the bands and just enjoy the money you will save – unless you go during the height of summer. Have a great time! Thanks for the tips! I am taking my 6 year old grandson in about two weeks. I am trying to buy tickets online but there a lot of options. We will be able to go to the park for two days. We want to go to both the park and water park. Do you recommend buying the two day park & water park ticket? I assume you need the water park ticket in addition in order to go to it. How about the all inclusive ticket for the pizza buffet? He will only eat 2-3 pieces of pizza then probably desert and a salad and 1-2 pieces for me. Is that worth it? We are staying the the Legoland Beach Resort and using the shuttle. We will not have a car there. Do I need one? Terri – I hope you have a great time. I don’t think you need the “inclusive ticket” for the pizza buffet. The park itself has great restaurants – even delicious sandwich shops and if he’s not a big eater, then it might not be the best deal for you. You don’t need a car! The Beach Resort is literally across a big intersection – you “could” walk too – but the shuttle will be nicer to use! I would probably visit the part ONE day and then the water park the other – and then finish the park or ride something again on the day you do the water park… ENJOY!!!! What is the best, affordable and safe way to travel for 1 day to legoland from a disney world resort? We are only going for 1 day but transportation is expensive to get there? You could rent a car for the day, or I think they may have shuttles from Orlando to LEGOLAND. It’s definitely worth a one-day trip to LEGOLAND. I just took our kids up there for the day (we are a two hour drive south of the park) – we had SO much fun… and the kids napped on the way back. Hi Abby, YES! It’s definitely worth going for a few hours. You can see a lot of the park in that time frame and your kids have the perfect ages. The lines are NOTHING like “the other theme parks” – so you will be able to experience a lot of things in a shorter amount of time! I hope you enjoy LEGOLAND!